❤【PROTECT BABY FROM SAFETY HAZARD】: This toilet safety lock is ideally used for locking the toilet lid, preventing piquant kids from opening the toilet lid to play with water inside, which is foul and full of germs, reducing the risk of falling into the toilet bowl and cause drowning issues, and giving no chance for kids to throw rabbish into toilet bowl and lead to obstruction. ❤【EASY ONE-HAND OPERATION PERFECT DESIGN】: Simple one-hand operation.Just push and rotate to open, then push button to close! ❤【QUICK STEPS TO INSTALL】: Instantly complete the installation by the 3M sticker in the back, just peel off the film and sitck, seconds only to take, and now ready to go. 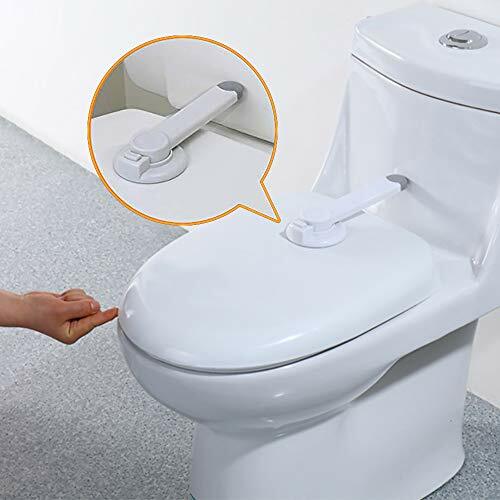 Fit for almost all toilets, no tools and no sophisticated learning courses. ❤【REGULATED TO BE DEACTIVE IF NOT NEEDED】: What about the unneeded time? Is is hard to remove or unload? The answer is Not at all! This toilet safety lock, can be easily activated while also easily deactivated when the lock is not needed or when guests visit you. ❤【MADE OF HIGHEST QUALITY ABS MATERIAL】: Compare to many similar products in the market, our baby proofing safety cabinet locks are made from the highest quality ABS material ensuring more flexibility and durability.